You may know that director Kevin Smith's first film Clerks spawned the Clerks animated TV series in 2000, although it only ran for one season. What you may not know is that, five years earlier, the indie hit was actually adapted for a live action TV pilot, starring Jim Breuer as Randall Graves and Andrew Lowery as Dante Hicks. The pilot was never picked up as a TV series, and now you can see why, since the full Clerks pilot has now surfaced online. The pilot also features a few more faces you may recognize. Keri Russell, three years before starring on Felicity, plays Sandra, a tanning salon employee, with Rick Gomez, best known as ADA David Vasquez from FX's Justified, playing an ice cream parlor worker named Todd. Screenwriter André Nemec, who went on to write the fourth Mission: Impossible movie, Mission: Impossible Ghost Protocol and Teenage Mutant Ninja Turtles, also plays Cliff, with Noelle Parker playing Dante's girlfriend Veronica, Bodhi Elfman portraying a thief named Ray and Jack Plotnick rounding out the cast as a cop. It's fairly easy to see why this sitcom wasn't picked up to series. Writer-director Kevin Smith had nothing to do with this pilot, although he and producer Scott Mosier were thanked in the credits. 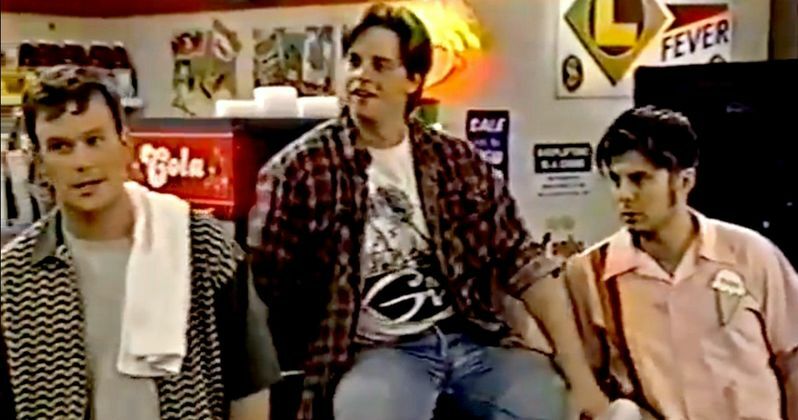 Ironically, original Clerks stars Brian O'Halloran and Jeff Anderson tried out to reprise their roles, but they didn't get the job. The pilot script was written by Richard Day, who went on to write for Mad About You, Arrested Development and Running Wilde. Everything ended up working out fine for all of the actors involved, but who knows what may have happened had this actually gone to series. Then again, the quality is so poor here it's hard to imagine this being green lit to series. The Clerks animated series didn't fare much better, but Kevin Smith and his cast was involved in that project that retained the same type of spirit from the original film. Kevin Smith is currently developing Clerks III, which will be the final installment of this indie trilogy, with production potentially starting this year or next year. The filmmaker is also making a sequel to Mallrats, entitled MallBrats. While we wait for more updates on those projects, check out the Clerks. unaired pilot episode.